As an avenue for progressive politics in a nation still sceptical of change, community organizing today faces significant challenges. This book assesses that activity within the context of political, cultural, social, and economic changes in cities - from World War II to the present - to show how community-based organizations have responded. 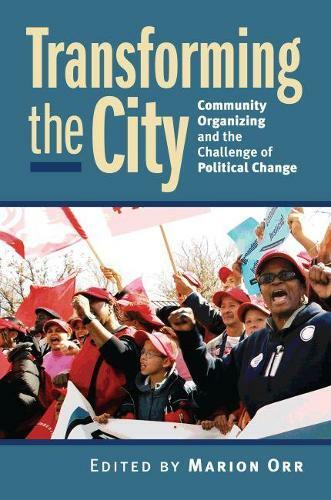 "Transforming the City" is the first book to examine the current state of community organizing in American cities, analyzing its place in contemporary progressive politics and assessing whether it has changed in response to changes in the political economy. Leading urban scholars - Peter Dreier, Dennis Judd, and others - have been drawn from a wide range of disciplines to offer original commentaries on the strengths and limitations of community organizing, a form of political and civic engagement that is too often overlooked by those who bemoan the decline in social capital. While embracing mobilization as a way to cope with the problems afflicting inner cities, these essays acknowledge the challenges inherent in globalization, de-industrialization, the demise of ward-based politics, and the values that shape contemporary American culture. They argue that larger changes in the political economy have reshaped the local ecology of civic engagement, thereby impacting the focus, orientation, and effectiveness of community organizing. The book features case studies from Chicago to New Orleans to El Paso, and covers community organizations from many of the organizing networks and models, such as ACORN, IAF, PICO, and DART. These cases address key policy areas such as education and housing, and the role of race in these issues and in organizing in general. By the actual practice of this form of democratic politics, they also show the potential of community organizing for addressing concerns about Americans' disengagement from civic and political life. Whether pursuing longstanding problems about housing or more recent issues such as wages paid by big-box retailers, community organizing continues to have an important role to play as part of a broader progressive movement. As America decides what kind of society it wants to be, these insightful articles illuminate those larger trends in the local ecology that are forcing organizers to alter their strategies, operations, and visions for the future.